Believe it or not, this hard-working dog breed earned his keep herding reindeer in his native Lapland, in the far north of Finland. Friendly and gentle, the Finnish Lapphund retains a strong herding instinct. 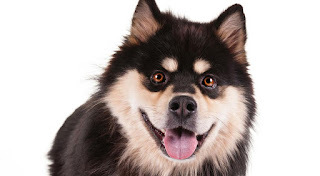 The Finnish Lapphund, also known as the Lapinkoira, Lapponian Shepherd Dog, Finish Lapland Dog, Suomenlapinkoira or Lappy, is a medium-sized dog that has the dense double coat typical of northern breeds combined with the temperament of a herding dog. The original Finnish Lapphunds were used for hunting and protection by the Sami, a tribe of semi-nomadic people who lived in Lapland, which is the northern region of Norway, Finland, Sweden and Russia. Eventually, the Lapphund transitioned to a herding dog, as the Sami settled into a more sedentary life of breeding reindeer. 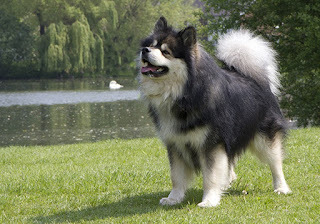 The medium-size Finnish Lapphund has a soft, sweet expression and a coat that comes in black, blond, brown, tan, and other colors and combinations. The Lapphund’s habit of barking harks back to his heritage as a herding dog. If you don’t keep reindeer, though, he can learn to moderate his barking, becoming instead a good watchdog and family companion. Coat appearance: A long, coarse outer coat tops a soft, thick undercoat. Coloration: white, black, red, and brown, as well as combinations of colors such as black and tan. The Finnish Lapphund was kept by the Sami, a semi-nomadic people inhabiting the far reaches of the Arctic north, Lapland, which comprises the northern regions of Finland, Sweden and part of Russia. The Lapphund’s job was to help to herd reindeer, but when snowmobiles came along his job went away. In the 1940s, interest in preserving the breed led to the writing of a breed standard, which was accepted by the Finnish Kennel Club in 1945, and establishment of a breeding program. At first, the dogs were called Lapponian Shepherd Dogs and included a shorthaired variety and a longhaired variety, both of which might be born in the same litter. 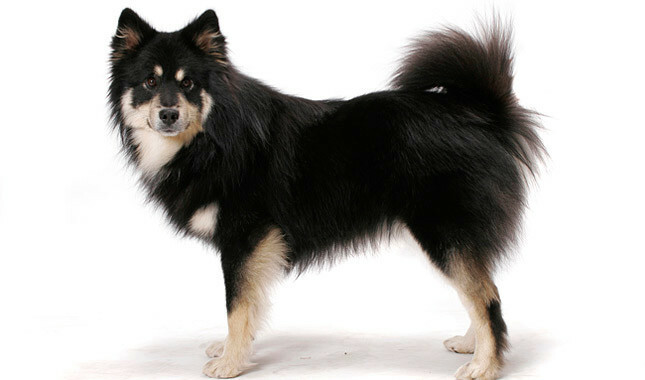 In 1967, the two types were declared separate breeds, with the longhaired dogs becoming known as the Finnish Lapphund. The dogs are popular pets in Finland. Finnish immigrants probably brought Lapphunds with them when they came to the United States, but it wasn’t until 1987 that interest began in achieving American Kennel Club recognition for the dogs. 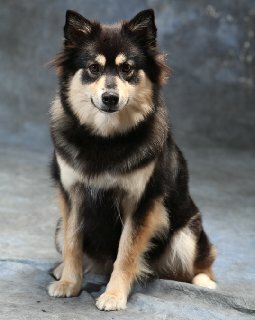 The Lapphund will became a member of the AKC’s Herding Group on June 30, 2011. The Finnish Lapphund is a very intelligent and active breed. Finnish Lapphunds take well to training due to their intelligence. Some owners and fanciers claim that "Lappies" even have the ability to think through actions first. Although small in number worldwide, a noticeable number of Finnish Lapphunds have excelled in activities such as obedience trials, agility, herding trials, and pet therapy. The breed is friendly and alert, and makes a good watch dog, due to its tendency to bark at unfamiliar things. The breed was originally used to herd reindeer by droving, and barking helped it to be distinguished from wolves. Even when not herding, the Finnish Lapphund tends to bark with a purpose, and more rare cases of problem barking can normally be controlled by training. The breed makes the ideal outdoor companion. It is active, coldproof, and waterproof, and will gladly accompany people on walking or running trips. A slight independent streak is common, though with training Finnish Lapphunds can have excellent recall and obedience skills. Lappies are ideal choice for a family with small children. The breed adapts well to family life, including being responsive to children. Finnish Lapphunds have a gentle nature with children, people with disabilities, and the elderly. This is a very friendly breed and it normally avoids and flees from threatening situations. The breed is very curious, so some supervision is recommended. In Finland, many Finnish Lapphunds have won national championships for obedience and lappies are also suitable for agility. Finnish Lapphunds are generally a very healthy breed of dog and do not suffer from a great number of hereditary ailments. They are however prone to eye problems like cataracts and GPRA, the latter which can cause permanent blindness. In addition to physical activity, the Finnish Lapphund needs a healthy dose of mental stimulation. As a herding dog, this breed will analyze a situation before deciding how to handle it. Fortunately, the Finnish Lapphund enjoys training and working with people. This breed is relatively easy to train and enjoys using its finely-tuned observational skills to learn what is asked of it. These are fairly “soft” dogs. They respond best to positive reinforcement and reward-based training, using praise rather than punishment. Finnish Lapphunds have strong noses and excel at scent-related activities, such as tracking, scent discrimination work and search and rescue. Finnish Lapphunds are extremely active, alert and ready to be part of whatever action is going on. They were bred for outdoor work around reindeer, cattle and horses, and they appreciate the opportunity to run and explore outside. Because they hail from frigid arctic areas, these dogs do quite well living in cold climates. They enjoy going for long walks with their owners and engaging in all sorts of active canine sports. Like many other herding breeds, the Finnish Lapphund has tremendous strength and stamina. This dog is perfectly suited for people who enjoy hiking, mountain biking, backpacking and other outdoor activities. The Finnish Lapphund wants and needs lots of exercise and may become restless and destructive if its energy needs are not met. 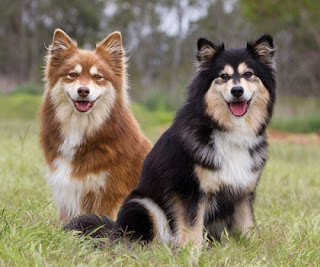 Like all spitz breeds, the Lapphund has a thick, profuse coat that sheds seasonally and requires regular brushing to keep flying fur under control. Brush his double coat weekly to keep it clean and remove dead hair. During spring and fall shedding seasons, daily brushing will help to keep excess hair under control. The rest is basic care. Trim the nails as needed, usually every few weeks. Keep the ears clean and dry to prevent infections. Check them weekly for redness or a bad odor that might indicate infection. If the ears look dirty, wipe them out with a cotton ball moistened with a mild cleanser recommended by your veterinarian. Brush the teeth frequently for good overall health and fresh breath. It is important to begin grooming the Lappie when he is very young. An early introduction teaches him that grooming is a normal part of his life and to patiently accept the handling and fuss of the grooming process. Good with Kids: This is a suitable breed for kids and is known to be playful, energetic, and affectionate around them. Is the Finnish Lapphund the Right Breed for you? High Maintenance: Grooming should be performed often to keep the dog's coat in good shape. No trimming or stripping needed. Easy Training: The Finnish Lapphund is known to listen to commands and obey its owner. Expect fewer repetitions when training this breed. Very Active: It will need daily exercise to maintain its shape. Committed and active owners will enjoy performing fitness activities with this breed. Good for New Owners: This breed is well suited for those who have little experience with dog ownership. 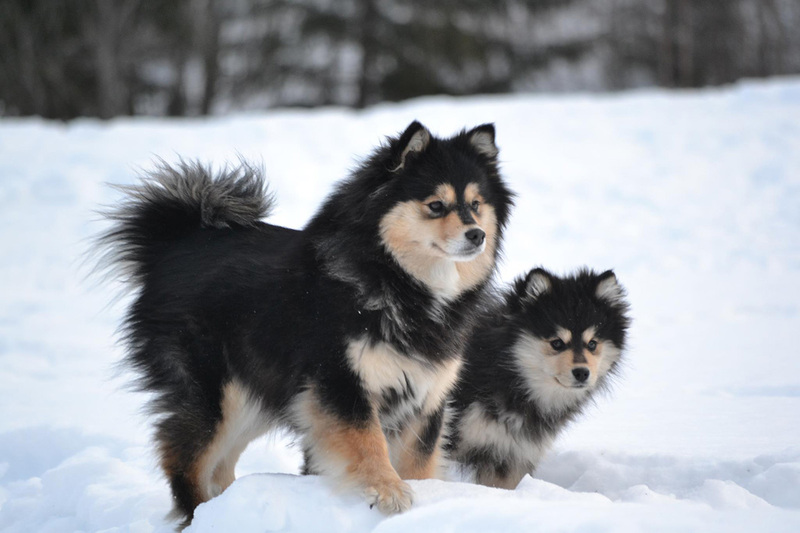 The Finnish Lapphund comes from the far north and is intolerant of heat. Keep him indoors on hot or humid days.